Arizona-based improviser Jeph Jerman founded animist orchestra in 1999 while living in Seattle. 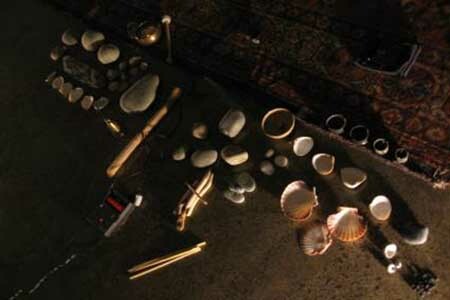 Using only unamplified natural objects as instruments – rocks, shells, feathers, seeds, twigs, etc. – the group’s aim is to create a listening environment that is not based on traditional reasons for making music, such as the sharing of emotion or the demonstration of instrumental prowess. Rather, they make sound to listen to, intuitively and with the simplest of means – delicate, extremely quiet, and completely spellbinding.